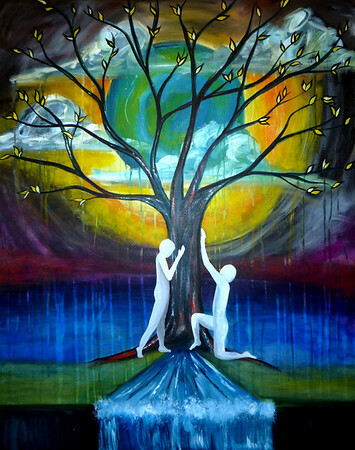 This painting is an illustration of the sustainable body of Christ. The tree in the middle represents the church in its current state. The man and woman in the center represent the children of God in a posture of intercession. They are praying for healing and the release of God’s people into their kingdom purpose, full of Holy Spirit and overflowing with Love. The new leaves budding on the tree represent the heart of the Church being softened in order to release control to the Father. The water flowing through the base of the tree represents the subsequent revival that will be the fruit of a whole and healed church functioning in its entirety. Alive and vibrant with life as it disciples and injects God’s people into every sphere of society. The earth in the background and the storming clouds represent the stage of God’s story as it is played out on the battle ground of our lives. It is a spiritual battle where God contends for humanity, longing to restore creation to Himself. His people are his hands and feet.